What's up, everyone? Marissa here, and, well, I have to admit I'm a little nervous about what kind of junk horror movies the wheel is going to throw my way. Fortunately, my first movie wasn't too bad. 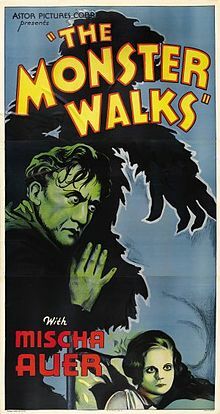 The wheel of torture gave me The Monster Walks, a 1932 not so classic haunted house (sort of) story by director Frank R. Strayer. Who? Exactly. I picture this guy fitting the olde ty-me director mold, as he churned out tons of craptastic 1930's monster flicks and yelled through a megaphone in that awesome old Tinseltown accent, calling everyone "Old Chap." The biggest name in the film is Mischa Auer, who is pretty awesome as the token bad guy. So long story short, a sweet damsel in distress comes to collect her ginormous inheritance from a kooky uncle whose hobbies included training killer apes. Side note, where my rich old uncles at? Anywhoo, we see killer ape hands attempt to kill our heroine and fail miserably. We quickly learn that the real monster here isn't the trained monkey, but, rather, the evil butler, who eventually has to battle the killer monkey. No, really. I would have said that was a spoiler alert, but, really I'm just saving you an hour and a half of life. You are welcome! Also, on a side note, albeit chock full of terribly racist and sexist characterization, the minority characters are the only smart people in this film. They get the heck out of dodge. So if you have a hankering for a 1932 classic horror movie, this one is not it. Try Karloff in The Old White House for a quality haunted house tale. Or, revisit Tod Browning's seminal 1932 classic, Freaks. If you are feeling bold, enjoy Halperin's early American take on the zombie genre White Zombie, starring an always awesome Bela Lugosi. Whatever you do, make sure tonight's a horror night!